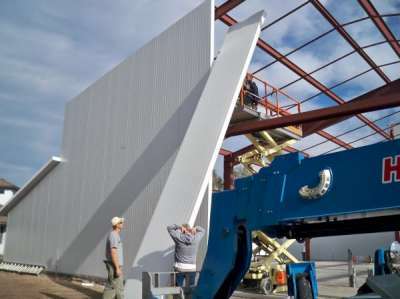 Coolstructures Inc architectural Insulated Metal Panels give architects and building owners unmatched flexibility for a broad range of applications. Coolstructures's Architectural Insulated Panel Systems are custom-engineered to meet demanding architectural and esthetic requirements, while adding structural and thermal integrity. Over the past 20 years, Coolstructures has developed an advanced insulated building panel system with high "R" values. These architectural panels offer unsurpassed thermal efficiency, they are easy to install and offer the lowest cost per "R"of any similar panel product. Coolstructures Architectural Metal Insulated Panels are manufactured in a variety of thicknesses between 2 inches and 12 inches. The different spans allow for the specific R-Values and K-Values needed for your application. Coolstructures's continuous laminating line can manufacture panels in any desired length and to each jobs specific tolerance needs. Coolstructures's panels are a snap to install, using a simple "tongue-and-groove" design than reduces thermal bridging (heat loss), so prevalent in more complex designs. 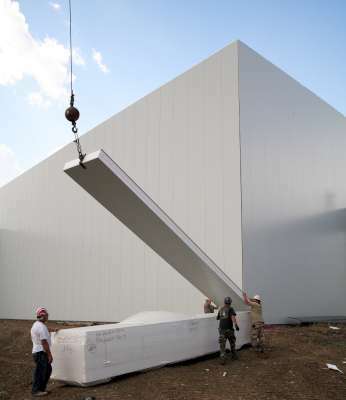 Panels simply slide into place and are easily secured to the building's steel superstructure. Applications include industrial, commercial, retail, and residential buildings. Whether walls, floor, or roof insulated panels are required, Coolstructures Inc can provide the ideal customized solution.